The first rule of Mitch McConnell is that, based on his track record, you can never trust his words or intentions. 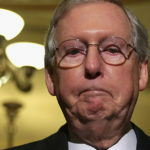 The second rule of Mitch McConnell is that he’s always going to do whatever he thinks is best for himself, even at the expense of the nation, other members of his party, and the overall well being of his party. That brings us to what McConnell just did to Donald Trump. At a time when Donald Trump is losing his shutdown battle and losing his presidency, he’s desperately needed Mitch McConnell to speak up in his defense, and help spread his lies. Usually, McConnell is quick to lend Trump this kind of hand. But the shutdown has seen McConnell largely hiding, and leaving Trump to fend for himself. Then McConnell finally emerged over the weekend, but only to publicly kick Donald Trump’s racist ally Steve King while he was down. It was a bad sign for Trump, because it suggested that McConnell had no interest in continuing to carry Trump’s water. Yesterday, McConnell sensed that the Republican-controlled Senate is eager to strike down Trump’s attempt at easing sanctions against Russian oligarch Oleg Deripaska. So McConnell did what he always does: he decided to protect himself by siding with his party, at Trump’s expense. McConnell lashed out at Vladimir Putin for being a “thug” and sent a clear signal to his Republican Senators that they’re free to hammer Russia, even over Trump’s objections. Trump is on his last legs and can’t afford to displease Putin right now, who could finish him off with blackmail material at any minute. Yet McConnell seems to be just fine with that happening, because he doesn’t want his own Senate influence to fall off as a result of siding with Trump on sanctions. Mitch McConnell then took things further by announcing that he will not allow a veto override vote if Donald Trump vetoes legislation to reopen the government without border wall funding. This is a subtle shift in language. But it’s a big deal because the only way there can be a veto is if the Senate holds a vote to reopen the government to begin with. McConnell just tacitly admitted that he’s now open to holding such a vote, and he’s falling back to not being willing to hold a vote twice. Again, you can never afford to trust Mitch McConnell, whether you’re a friend or foe, because he’s smart and evil and he’ll always do whatever is best for himself, at your expense. Usually, McConnell is busy screwing over the country. This time, he’s decided that the best move for himself is to begin selling out Donald Trump. With friends like McConnell, who needs enemies?